Rocco & Co is an Auckland based dog apparel company that specialises in beautiful homemade pieces. 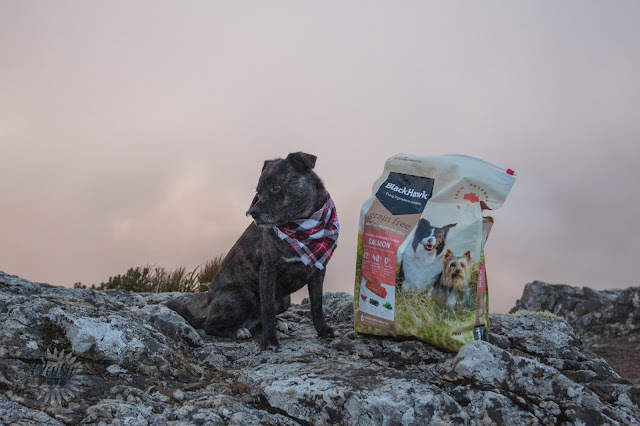 Rocco & Co has been around for a few years now and sparked from the lack of cute products that Alyce could find for her pets Rocco and Ali. Since then the brand has grown a strong Facebook following, and has tonnes of happy customers. Today we are going to look at their new Christmas collection, which you will need to ASAP if you want to get it in time for Christmas. Trust me, you will want to order up a storm. Make sure to read to the end for a special code within the post to save you some money at checkout. 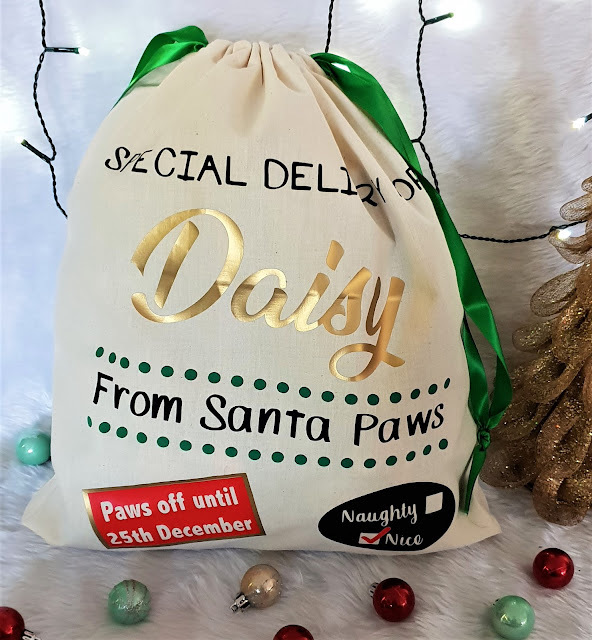 I want to start with the Personalised Santa Sacks as these are such a creative and cute product that I have not seen done anywhere else. Each Santa Sack is homemade by Alyce and customised to add your pets name in either glitter, gold or silver. I nearly purchased one of these myself, but then realised that Diego is getting no presents for Christmas, so this will be perfect for those that like to absolutely spoil their dogs at this time of year. Trust me, I know that is a few of you reading this! 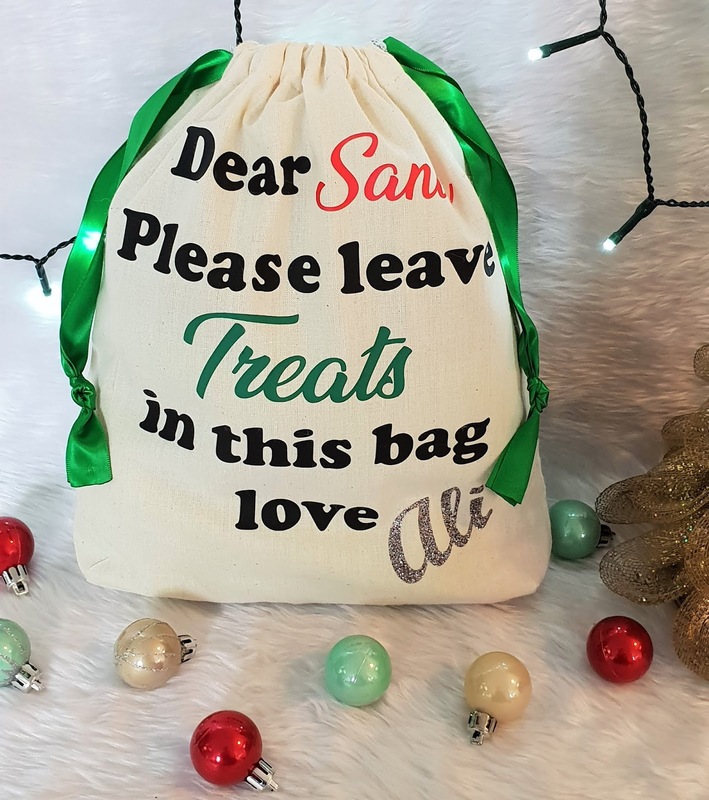 You can fill this sack with all their presents, or even better, you can buy it from Rocco & Co with gifts already inside! If you buy the Santa Sack Set, you get the sack, along with a pack of treats and two items out of either a bowtie, neck tie or bandana. This would not only work for gifting for your own pooch, but would make the perfect gift for a dog loving friend. 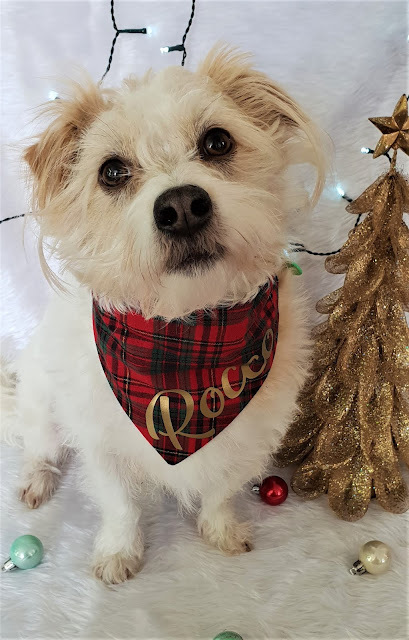 A big difference between Rocco & Co and other bandana companies is that they understand that not all dogs wear collars, or people have personal preference on what style of bandana they like. 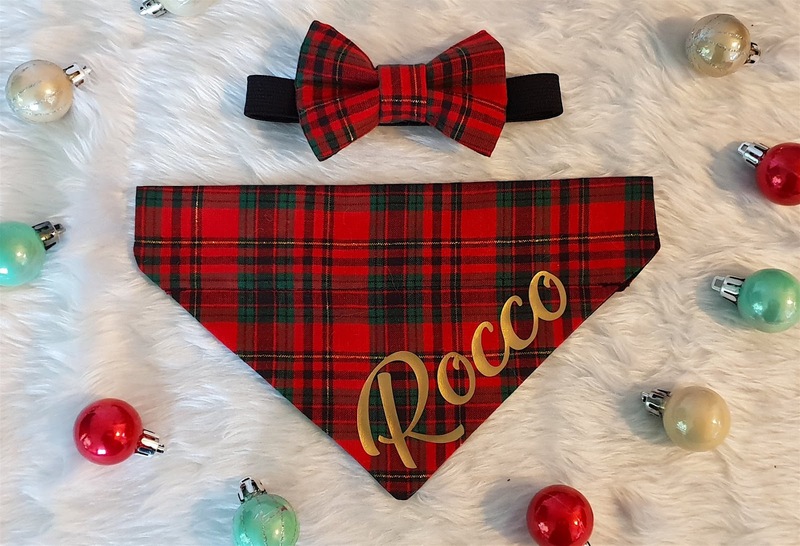 What this means is that Rocco & Co make over the collar bandanas, as well as ones that can be made with elastic to perfectly fit your pets neck. This is a huge bonus for me as some of you may know but I don't have a huge warm spot for over the collar bandanas. I always feel like they clash in prints, and I like to have one cohesive look on Diego if possible. The elastic version is a great alternative as well if you use a harness when walking your dog, but still want them to be dressed to impress without tonnes of equipment on. All their bandanas are customisable in this way, so if you have a preference just make sure it is known and they will custom make it for you! Following on from that then, you NEED to see these adorable bow tie and bandana sets that she makes in both tartan and striped pattern. Both look super festive and would suit any dog. I am actually quite obsessed with tartan at the moment, and this tartan print that she uses is perfect for Christmas. The sets is a great idea to get two cute accessories for a cheap deal, but if you aren't interested in buying both, you can buy each one separately. What I am more obsessed with than just the tartan bandana, is the custom name tartan bandana. Below you can see Rocco rocking this one, and it looks incredible. The gold on the tartan is how I wish for all of my Christmas to look like, and I actually can't get enough of it. This look would also work on all different dog fur types! I think personalised bandanas are a thing I have kind of slept on. I have one bandana that has a 'D' patch on it, and I love that one but that is nothing compared to having his full name on a bandana. I have linked here to all of Rocco & Co's Christmas Products and you need to check them all out. I have only mentioned a few of the pieces amongst their Christmas collection and the rest is just as beautiful. What is even better is that I can offer you a discount code today thanks to the generosity of Alyce. If you enter CHOC at checkout you will receive a whopping 30% off! This is such an amazing discount and she is so wonderful to offer such a large discount. I would highly recommend ordering within the next few days in hopes of it arriving in time by Christmas as all pieces are custom made it can take a little longer to ship than other online stores. If you do purchase from their store, please let me know cause I would love to see and hear what you get! I think it is important to note that no one is a perfect dog owner, no matter how they portray themselves to be. I was apprehensive to write about this incident because I didn't want either dog to look bad, or for myself to look bad. However, I think it is important to share failures and hard times as well as the good to help others who may be going through a similar situation. 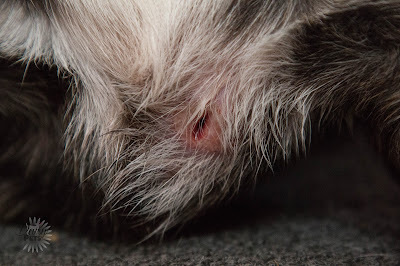 Warning this post does contain pictures of blood and wounds. 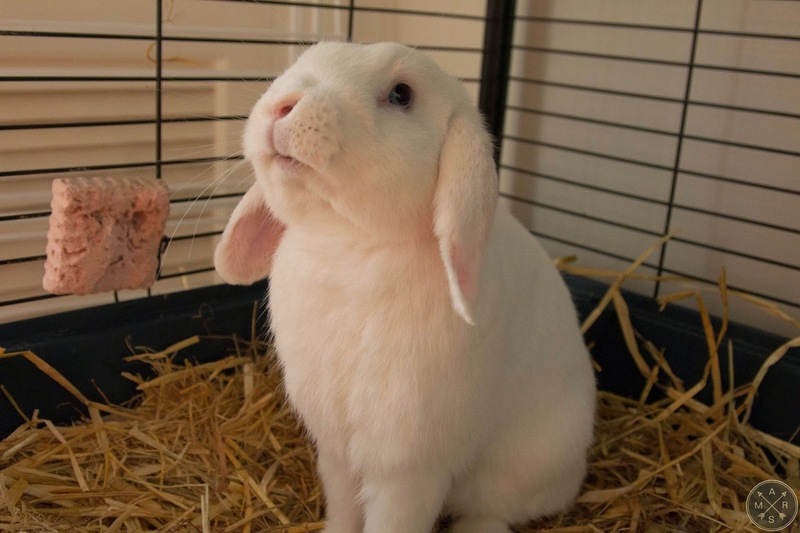 Daisy passed away from liver disease and so from first getting Diego I was very aware of what I was feeding him. When I owned Daisy, I was unfortunately in a time of my life where I could not afford the top quality dog food, and just generally went for the cheapest type available at the supermarket. This isn't the best food, and a lot of the time has less real meat in it than fillers. I think this was a huge factor in her getting liver disease, and I may be wrong, but I would prefer to edge on the side of caution with Diego so I don't have to go through that again.